linings with ordinary typing weight paper. They adhere more evenly and don’t make the envelope too bulky. LOVE this idea! :o) And your card is so fun – I love how you wrapped the design right around to the back! Wonderful idea! I can’t WAIT for your postings! I love “stamped by” stamps for the backs of my cards! What a FUN idea to use for your sets!! This is very cute, the colors are so fun together! Such a neat idea to wrap the strip to the back of the card! I love it! Great color combo. I really like the rounded corners and the simplicity of the design. I love how the envelope and card coordinate. I do (almost) always forget the back of the card! Good idea about bringing the ribbon around the back! Thanks for your ever inspiring blog. I love it!! I just love the ‘Handstamped By’ stamp, such a good idea. Also love the coordinating envelope. Can’t wait to see your stamp sets! Awesome ideas … wrap around and coordinating handstamped by. Love the project and envelope! Love your idea. It does make sence to continue to the back of the card. Great color combo. Love the idea of having a stamp for the backs of every one of your cards and it coordinates! i LOVE the matching envelope! and the rounded edges… lovely touch! Great idea. So glad I just found your blog … as I read I am so inspired. Now I have to go back and look at archives because I don’t want to miss a beat. 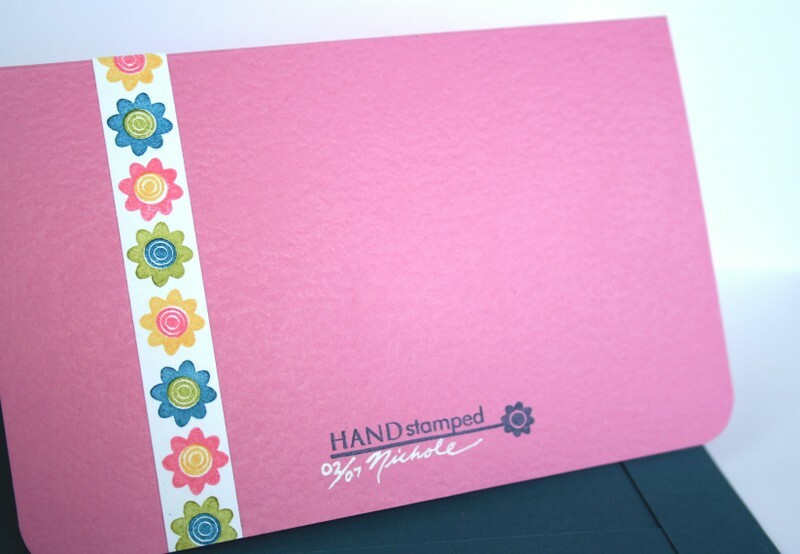 Love the color combination on this card – also love the flower stamp with the swirly centers! I always make it a point to put something on the back of the card as well as on the envelope. It is just one more little surprise for the card recipient. Plus personalizing the back means there is no mistaking that you took the time to make something really special. What a great idea to sell sets that incorporate an idea for the back of the card! very clever. The back does get shafted, I think. I am going to do this very idea on my Easter cards. Thanks for the nifty idea! PS I am new to your blog. LOVE It. Why did I never think to bring the design to the back? Remember that Hallmark commercial where people always look at the back of their card? I still do that! Great design! The “handmade by” stamp is such a fantastic idea!! Love it! personalized front to back, a completed project i love! another great idea! love the “handmade by” stamp too! can’t wait to check out your new goodies! Sign me up for that ‘hand stamped’ stamp! I’m sure that will be one of my first purchases. Can’t wait, Nichole! What a great idea for the back of our cards…YIPPY. What a great idea and a nice personal touch. Great thinking! What a GREAT idea to include Handstamped By stamp in your sets! Love the look of this card & envelope!!! Love the card and what a great idea to continue the design onto the back side of the card! Great way to complete your project with the included “hand stamped” stamp. I love that the stamp sets will have the “signature stamp” to match. What a great idea! So beautiful and the hand-stamped image is such a classy touch! I’m getting so excited to see this set. Great idea! I like to add a tiny image to the back of cards I stamp and do the same to the envelope. I love your card and what a neat idea to include a coordinating “stamped by” stamp with your sets! Love that idea….can’t wait to see what you’ve got! I always forget to sign my stamped card. I guess after all the time I put into it, I set it aside and look at it and critique myself. Some I would not want to sign either-those are the ones my niece takes because she loves them. When I remember to sign them, I have a tiny mouse stamp and I add my initial under it. I like this idea better. the handmade stamp on the back! I love how you continued the stamp strip to the back of the card. And the “Hand Stamped…” is unique – a very clean design. Love the way your ribbon continues onto the back of the card. Gives an extra punch. I guess I should start putting something on the back of my cards to indicate they are hand stamped. Thanks! how cool is that tip??! LOVE the card & matching envelope!! Thanks for sharing I am enjoying this SO much! super cute – love it!! So cute Nichole! I love visiting your blog everyday and see what you’ve come up with. I’m a hopeless “caser”! so pretty! I like the colors a lot! Wrapping the design around to the back of the card!! Uh huh… what a great idea indeed! And the “stamped by” — LOVE it. LOVE your wrap around and coordinated made by stamp – also a little personal touch I like to do. love the idea of a different stamp for the back on every set— those are always so fun!!!! FABULOUS idea about the coordinating back side stamp! LOVE IT!!!!! Oh my goodness, Nicole! I’m so excited for you! I’m a big fan of your work and I can’t wait to get my hands on these new goodies! Love the coordinating back stamp – what a fabulous idea! Oh this is so pretty!! And YEAH! I am so excited about the stamps for the back of the cards! I’ve always wanted those!! Hi, LOVE the pp! Where can i get some? ?/ Can’t wait for the day! super super cute. Lovin’ your images. Gorgeous, I agree that adding your own touch to the back of the card “completes” it…I feel the same way about the inside. I like to line my cards (if they are dark colors) and use a cute punch to add an accent to the bottom corner. I love the little flowers with the spiral centers! And the idea of continuing the design to the back of the card – leads the eye to the signature! Great colors, too! what a great idea!! the matching envelope is darling too! thanks for sharing! That is the easiest WOW technique I have seen. Can’t wait to try it! I love these stamps and I am so impressed with the stamp to go on the back. My friends ask me all the time why don’t you sign them on the back?? Love the simplicity of this design, yet it really pops. You have given me much to think about here. I love coordinating my envelopes with my cards, and this would allow me to coordinate EVERYTHING! What a great idea!! Can’t wait to see the new stamps. How totally cute! Love this idea!! I love the idea of continuing the design on the back of the card! Love the envelope. Congrats on your line of stamps! Love the card, the colors, the additional touch on the back. So pretty! I can’t wait to see these stamps. “Handmade by” are my favorites. Thank you! So far this is my favorite card. Love the “hand stamped” stamp. Great ideas! wow, what a great idea! I love the card too…simple, but just beautiful! Thanks for giving us this chance at a new set…how exciting!!! Oh my goodness–this is super! Can’t wait to get some of those stamps. Another great, inspiring idea, Nichole!! I also like how you signed and dated the card. Thanks so very much for sharing all these cool ideas! What a great idea!! I love that flower on the front – is that one of your stamps, or a die cut? I’m looking forward to seeing your new stamp line! How pretty and bright! Very creative. I am so in love with these flower stamps! I love the idea of continuing the elements of the front, onto the back. great reminder and great card. I am loving this little flower! Brilliant idea to have a “stamped by” stamp in each set…. Oh I love the idea of the coordinating stamp for the back. As it is right now I use a stamp on the back that I have used in front or inside and put my initials somewhere near it. Can’t wait to see the whole line of stamps. Thanks for the tip about the envelope liner and HOW COOL that there will be “Made by” stamps in every set! LOVE the idea of continuing to the back!! Beautiful!!!! I love this card! I love the little stamped strip around it and inside the envelope! Very sleek looking! I love this card with matching envelope! Such cheery colors. Thanks for sharing. Extremely cute! I love the colors and the cute flowers! Great matching envelope! how fun! never thought to do something continuing to the back. What a cute card. I love the colors and the matching ‘Hand Made’ stamp is just wonderful. TFS! I love this idea, (why didn’t I think of that).Love your card! This is such a sweet card, made even better and more complete by the darling envie! What a great new idea to dress up the back. I love this layout and the colors, and of course, those cute little flowers!!! Oh, I LOVE LOVE LOVE that idea. I can’t wait to see what this set looks like. Your creations are amazing. i’ve been waiting for just the right “created by” stamp and i finally found it, thanks! Love the idea of taking the design around the back of the card! To cute! 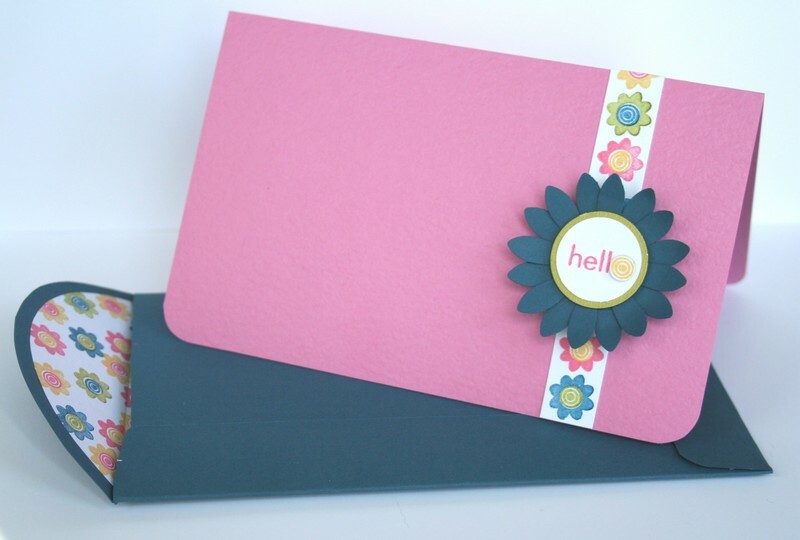 Love the color combo & the decorated envelope. What a fab idea to include a backstamp in each stamp set! This is a great idea and the colours are beautiful, how do you make such great envelopes? I’m so curious and haven’t found the answer on other blogs just yet!?!? Another neat idea. Thanks for sharing. Love the color combo on this card and a great idea for the forgotten side of our cards. The coordinated “handstamped” is brilliant! I love the idea of carrying on the image to the back! Thanks! Cute! I absolutely love the matching envelope!!!! What a SWEET card! Best of luck in your new endeavor!!! The site is BEAUTIFUL!!! What a sweet & simple card. Nice job. What a great idea for a stamped by stamp to match, these sets will be a big hit for sure! Love the colors! I love the idea of a “handstamped by” stamp with each set! Very clever – and very nice card! Can’t wait to get that stamp! I’ve seen some others, but this one is much more sophisticated…thanks! I really love your simple designs! Love the idea of continuing the strip to the back as well as the coordinating envie. I need to get an envelope template now! This set is so cute. I love the “hand stamped” stamp with the long stemmed flower. Gorgeous! Very refreshing and cheery card. I so encourage everyone to sign the backs of their handmade cards. A great idea to include it in the stamp set. This is a simple but beautiful card. And how clever to bring the design to the back of the card! LoVE this card! lOvE the envelope with the patterned paper peeking through and i LovE the front and back of the card. I think handmade cards are like little pieces of art, so you must sign the back!!! Oh, I LOVE the envie, and the back of the card!